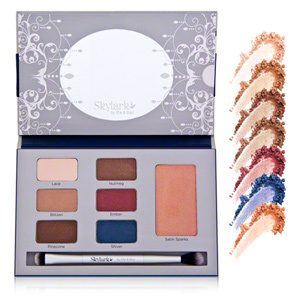 Skylark Cosmetics is a line developed by Elle and Blair Fowler (sisters), known for their Youtube beauty guru videos. I am fans of both of their channels and purchased this palette to support their cosmetics line, never mind the pretty colors in the palette. If I had seen this advertised and didn’t know of Elle and Blair, I probably still would have purchased it. This palette comes with six shadows and one highlighter. They are all very large with the shadows at .07 oz. each and the highlighter at .2 oz. This is one of my favorite basic neutral palettes because it has a range of brown shimmer shades and one matte vanilla shade, plus a cranberry and a dark blue shimmer shade. I take it on most short travel trips because I can get just about any look I want with this palette. The shadows are super smooth and creamy and easy to apply. They last all day for me (I use a MAC Paint Pot daily under all my shadows) and there is absolutely no fall out. The colors are very rich and highly pigmented. The shades Nutmeg and Pinecone are almost identical, but that is one of my favorite colors of brown shadow, so I use that color more often than the others and don’t mind having a bit more of it. The highlighter is such an amazingly perfect shade, I would purchase this alone if I could. I have not used any other highlighter since I got this one. It is a bit glimmery and the perfect shade to highlight without making those areas too light but you don’t need much of it and it is easy to over-apply so start out with a light hand. This also lasts all day. I honestly didn’t expect such great quality from this, as it is currently the only makeup product other than lip gloss that Skylark offers (and it came out about a year ago!) but I would definitely repurchase this item. It is a great gift item for people new to makeup or for travelers as well because it contains all the essential eye colors along with two brighter shades to vamp it up a bit if needed, plus the gorgeous highlighter. I am really hoping that more Skylark products emerge soon. They are exclusively sold at Blush.com. Cons: Some may not like that two of the shades are very similar, but I don’t mind it with that specific color. 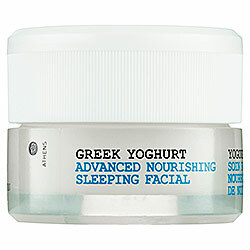 This is a weightless, ultra-hydrating night-time facial treatment packed with vitamins, minerals and proteins to restore health to skin. I had this for awhile and refused to try it out. I just couldn’t get past putting a dairy product on my face to sour overnight. Plus, I’ve never really been one to use food for beauty purposes anyway. Ashley tried this and loved it so I finally decided to give it a go, that is if it smelled nice when I opened it. It smells good. It smells super good. Can’t really describe it, sort of fresh but not floral, and it doesn’t make me sneeze like most fragranced beauty products. The texture is thick and creamy but it spreads well and doesn’t tug on my skin when I rub it in. I used it as my last step in my night-time skincare routine. When I woke up in the morning, my skin was so radiant and youthful looking, I couldn’t believe it. I really didn’t expect a change after just one use. This shows how hungry my skin is even when it doesn’t look or feel dry. I was not over moisturized at all and I was not greasy. My skin had a wonderful, glowing balance to it that was so natural feeling. It just felt like super healthy skin, the way skin is supposed to be. I continued to use it nightly for a week to see if I ended up breaking out or getting greasy but neither happened. Each morning my skin looked and felt great. Towards the end of the week, my face did sort of feel slightly heavy, but this is not meant for daily use anyway. I recommend using this three times a week for normal/dry skin, but when I get a bit more dry in the winter, I may use it a bit more often if needed. I will be excited to see if this is able to sustain the health of my skin over the dry winter months. Maybe I won’t need to up the usage if my skin is healthy from the inside going into winter. Cost: $45 for 1.35 oz. Hello Lashes is a treatment mascara that is supposed to take the place of volumizing mascara, conditioning lash primer, lash enhancing serum, lash tint and lash curler. Basically, you get a conditioning mascara that you don’t need to use a lash curler with. It is packed with vitamins and conditioning oils and has none of the chemical ingredients or fragrances that can irritate eyes. I got this because I have issues with my lashes falling out when I use certain mascaras and wanted to try something that would be healthy and less drying for my lashes. I have been getting fed up with the unreliability of my Buxom Lash. Sometimes the formula is dry and flaky, other times it’s great so I never know what I’m going to get each time I purchase a new tube. The wand on Hello Lashes is very slim, with minimal bristles on it and the tip has a little round ball with its own bristles. The handle has a spongy little gripper on it to hold onto while you apply, and while I thought it might be awkward, I really like it and it does make it easier to keep my hand steady and work smoothly. I do like the more narrow wands because it is easier for me to get to the root of the lashes without smudging it onto my face or in my eyes but I find that they rarely deliver much product. By the look of this wand, I didn’t expect much, but it is amazing! It delivers a ton of product onto my lashes in one swipe and it isn’t sharp at all (I tend to scratch my contacts quite often with bushy brushes). I have not had any trouble with it smudging onto my face or getting in my eyes during application and the little ball on the end is tiny enough to reach the little lashes in the inner corners without touching my eye. There is usually no clumping (sometimes there is too much product on the want, just swipe it back into the tube and bring it out again while running it along the edge) and it literally lasts all day with no flaking. One coat of this makes my lashes long and full but two coats make it look like I am wearing false lashes, no one believes they are real, which is great for me since I’m allergic to lash glue. The brush and the formula are genius and I have definitely found my HG mascara. This photo shows one coat of Hello Lashes on the right (my left eye) and bare lashes on the left. This photo shows one coat of Hello Lashes on the right (my left eye) and a coat of Hello Lashes followed by a coat of Buxom Lash on the left. It only comes in black, which I think is the color most people like regardless of their natural lash color. The finish is a semi-gloss. It’s not wet looking but is definitely not matte. Perfect in every way for my preferences. 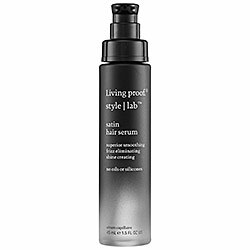 Although it provides a decent amount of volume, it lengthens quite a lot. I have not used this long enough to determine if it has changed the texture of my lashes, but I swear they look fuller and healthier when I’m not wearing makeup. I do know for sure that I have no lash loss with this and it does not irritate my highly sensitive eyes. I’ve been using it as a first coat of mascara, then using my Buxom as a second coat for now until I get it used up. I only plan to re-purchase the Hello Lashes in the future. Cons: Only comes in black. I received these in my September Ipsy glam bag and promised a review of them after I’d had the opportunity to try them out while traveling. I wanted to wait until I thought I might really need them so I could see if they did the job. These gels are supposed to de-puff and reduce lines and wrinkles while firming the under eye area. They come in a little reservoir on a plastic sheet. You have to peel them off and stick them on your face under the eye area. They are fairly large, beginning at the bridge of my nose and reaching all the way around and over to just below my temples. They are one time use. Application was easy, but when I used my second set, I ended up putting them too close to my eyes and couldn’t close my eyes correctly while they were on, but they didn’t burn or bother my eyes at all. They stay on securely. You can go about your business doing whatever you need to do and not worry about them falling off. After ten minutes, I peeled them off easily. They came off so nicely without any pulling that it was hard to believe they had stayed on with no issue. I did see a big difference in the skin under my eyes. It looked refreshed and rejuvenated. I noticed some reduction in darkness even though the product doesn’t claim to do this, and also a reduction in puffiness. I used these before bed, thinking they would leave a residue that would work like a treatment overnight, but in the morning, my eyes look like they always do. I think this product would be better for a quick pick-me-up in the am rather than for night use as it doesn’t seem to provide any long term results. I liked the feeling of these though, they were very cool and refreshing without feeling like there was menthol on my face. I would definitely purchase these again even though the results appear to be temporary. They wouldn’t be something I’d use every day, but they are definitely a treat for over-tired or stressed travel days. 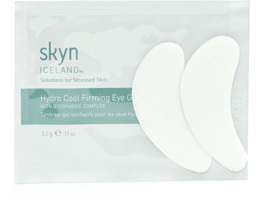 Be sure to check out the Skyn Iceland store locator, as their products are sold at some unique places like Urban Outfitters and Victoria’s Secret. I followed the instructions on the package and used this on my damp hair. Following my normal routine, I let my hair dry overnight and brushed/styled in the am. First of all, brushing through in the am went great. There were no tangles and my brush ran smoothly without snagging anywhere. I did not expect this, as the texture of my hair was somewhat sticky and tacky. I thought it was going to be a mess to get through. The texture completely contradicts the manageability. I had used this in place of my treatment oil the night before and thought my hair was more frizzy than normal rather than less as the product promised. I was hoping the stickiness would go away with heat products after styling, but it didn’t. It remained sticky all day and I couldn’t wait to get home to wash it out. I checked the ingredients and there is nothing I could pronounce listed there, not even water. I have no idea what this stuff is made up of and there isn’t much info on the Living Proof website either. I did not notice that my styling time was cut, but my hair is not unruly so I didn’t expect much change there. I also did not notice any lasting beneficial results from this product. I definitely do not plan to use this a second time. Cost: $29 for 1.5 oz.